Little River Railroad #126/Columbia River Belt Line "Skookum"
1909 - 1909: Little River Railroad #126. Townsend, TN.  1924 – 1930: Transferred to Carlisle subsidiary Newaukum Valley Railroad Co #7. Onalaska, WA. 1931 - 1933: Carlisle Lumber Company #7. Onalaska, WA. 2005: Sold to Chris Baldo, Willits, CA. Moved to Tillamook, OR for rebuild. -Painted olive green with gold lettering when built. -While at Carlisle Lumber Company, extra handrails added to pilot deck, headlamp moved to pilot deck, and air pump moved to front of smokebox. 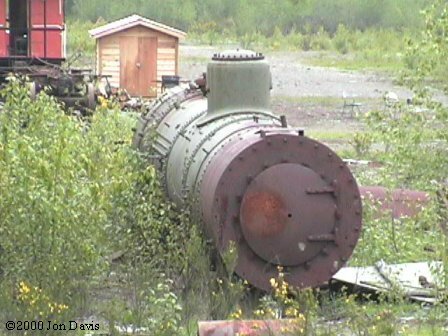 These modifications were later reversed by Deep River Logging Co.
-Unknown date - Air reservoirs on engineer's side removed. In June of 1909, Baldwin built 2-4-4-2 #126 for the Little River Railroad of Townsend, Tennessee. The first Baldwin Logging Mallet, #126 weighed over 162,000 pounds, which was lighter than any Mallet Baldwin had previously built for a domestic railroad. Still, #126 was deemed to be too heavy by Little River and was quickly returned to Baldwin for replacement. 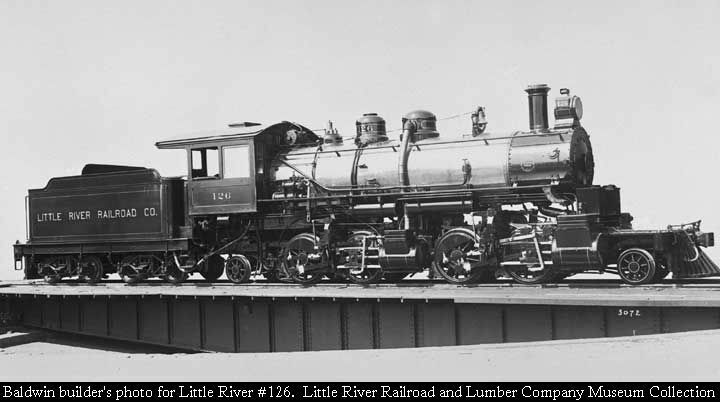 Baldwin built a smaller replacement Mallet, Little River #148, and offered #126 for sale. 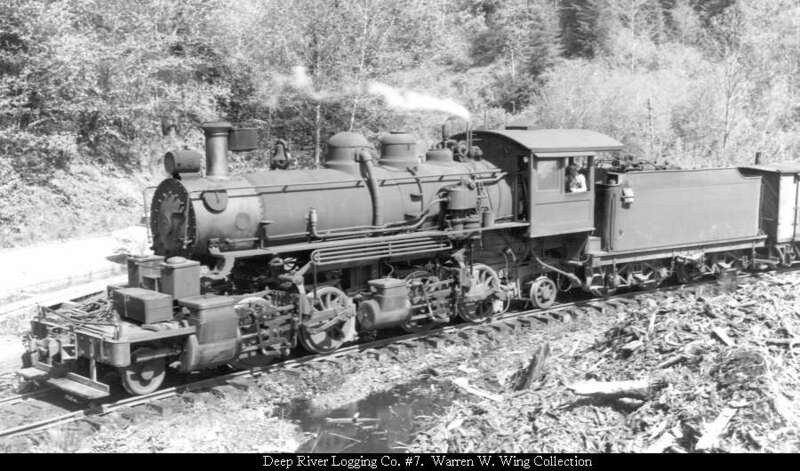 In 1910, the Whitney Company of Blind Slough, Oregon purchased #126 for their subsidiary logging railroad, the Columbia River Belt Line Railway. The Whitney Company assigned names to their locomotives rather than numbers, so #126 became the "Skookum," meaning "strong" or "well made." 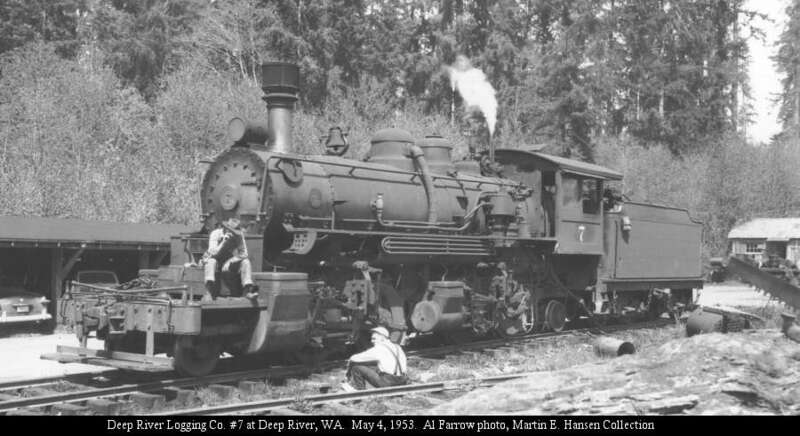 At Blind Slough the Skookum became known as a vary capable locomotive, and it remained with the Whitney Company until 1920 when the Mallet was sold to the Larkin-Green Lumber Company, still at Blind Slough. 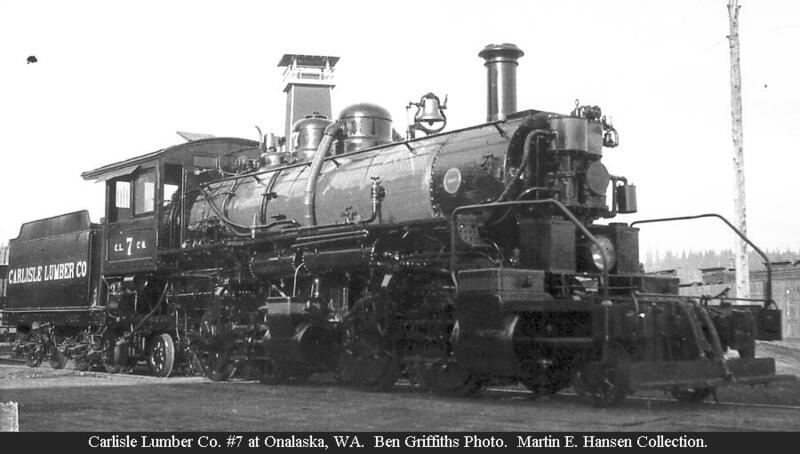 Shortly thereafter, Skookum was sold to the Carlisle-Pennell Lumber Company of Onalaska, Washington. At this point the name was discarded in favor of the number 7. #7 worked for Carlisle and their subsidiary Newaukum Valley Railroad through the 1920s. The locomotive was rebuilt during this time with extra handrails added to the pilot deck and the air pump was moved to the smokebox door. At some point in the 1930s, #7 was leased to the Mud Bay Logging Company of Mud Bay, Washington. 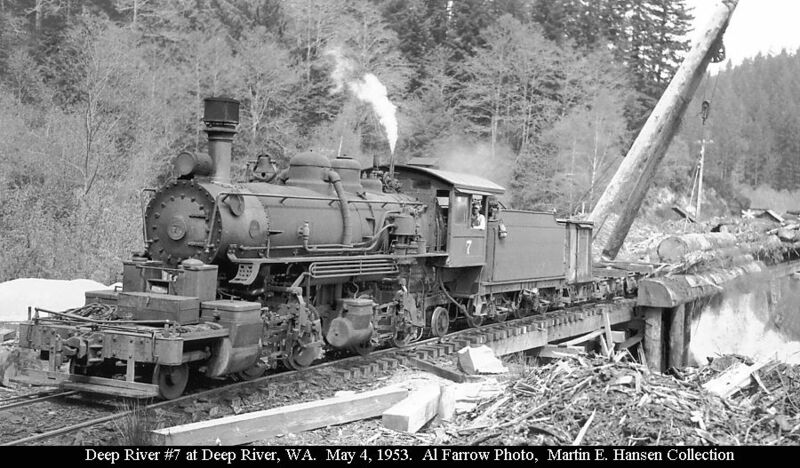 After Carlisle had cleared their timberlands and #7 was no longer needed, it was sold to the Deep River Logging Company of Deep River, Washington. Deep River reversed the modifications made by Carlisle and operated the little Mallet into the 1950s. In 1955, #7's logging career came to an end when the locomotive derailed and rolled onto its side while backing with a string of empty logging disconnects. Deep River was abandoning their logging operations at the time and the decision was made to not recover #7 from the woods. The rails were torn up and #7 was left in place. In 1956, railfan Charles Morrow of Snoqualmie, Washington purchased #7 from the insurance company for scrap value. Charles Morrow was one of a group of enthusiasts that in the late 1950s formed the Puget Sound Railway Historical Association. 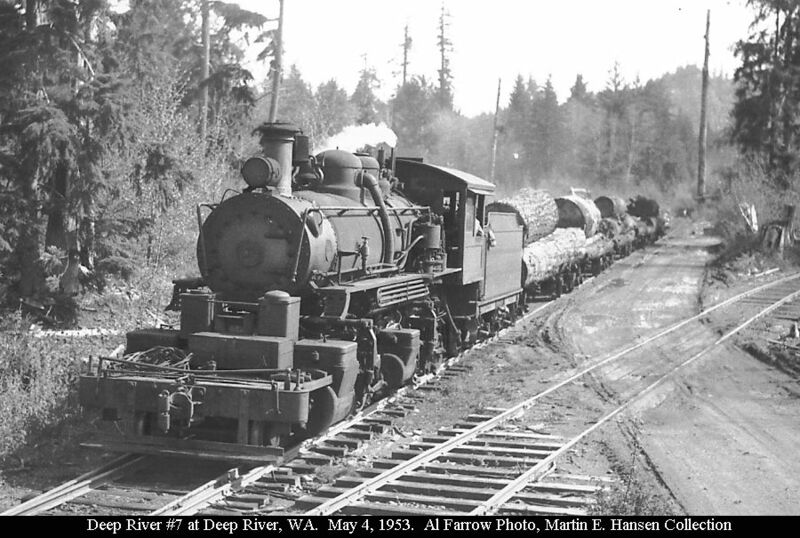 In 1960, Morrow and several others went to Deep River to dismantle #7 and move the locomotive to Snoqualmie, Washington. 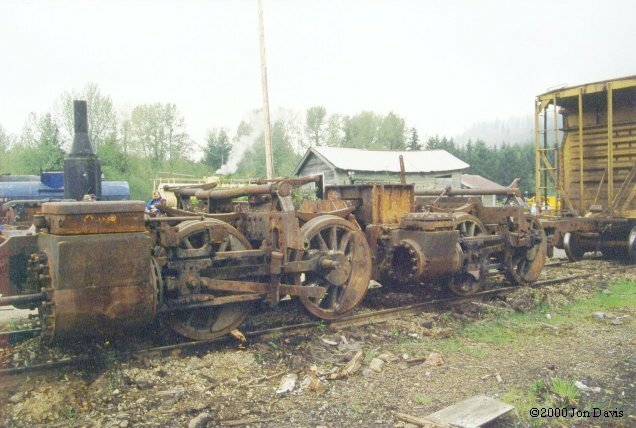 Once at Snoqualmie #7 was left in pieces strewn about the PSRHA's Niblock Yard. Plans to reassemble #7 for some reason were never carried out and after Morrow died in 1978 #7 was purchased by Rogan Coombs. #7 remained in storage at Snoqualmie until the early 1990s when the many pieces were moved to the Mt. Rainier Scenic Railroad's maintenance yard at Mineral, Washington. In January 2005, #7 was sold to Chris Baldo of Willits, California. The locomotive has been moved from Mineral, and the chassis is currently in Tillamook, Oregon for rebuilding. 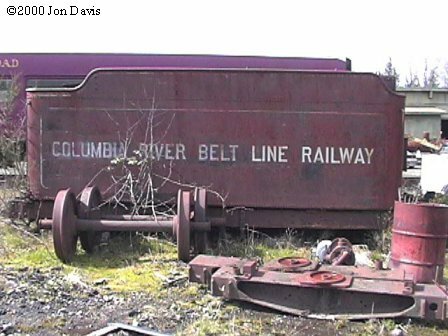 Columbia River Belt Line Railway "Skookum"
As Columbia River Belt Line "Skookum:"